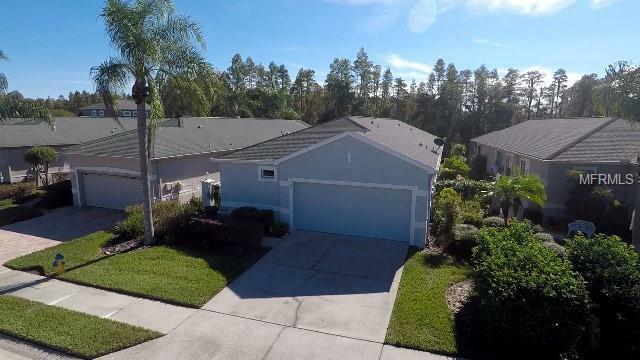 Welcome home to the Groves, the pinnacle of 55+ active adult maintenance free gated golf community and fall in love with this WATERFRONT home with enlarged screened patio to enjoy your wooded waterfront view. Fabulous open floorplan for entertaining friends with high ceilings, large kitchen and all 3 bedrooms have a private bathroom. Updated kitchen in 2015 features granite counters, Stainless Steel appliances open to living spaces accented with crown molding have new porcelain tile with 6" baseboards a formal dining area and a casual eat kitchen table. Enjoy the planned activities and at the Groves Golf and Country Club complete with Large club house with restaurant, ballroom, library/media center, exercise/art/card rooms, & pro shop. Relax in the heated pool or join some of the activities including tennis, pickle ball, boccie, shuffleboard, cards, travel club, yoga, or join the community garden, social, travel, book, or card club. Karaoke & Restaurant/Bar, Ballroom for special events. There are fishing holes and a nice shaded dog park as well as miles of trails for nice strolls. The HOA covers mowing lawn, cable TV (3 boxes), exterior painting every 7 years & roof replacement every 17 years. Convenient location and a short with a golf cart ride to the local Publix, restaurants, salons, bank, vet and shops. Just north of Tampa, airport and lots of shopping. Centrally located and convenient to beaches and amusement parks. The Groves isn't just a place to live it is a fantastic way to live life. Listing provided courtesy of Blue Sun Realty.